Lush Fab Glam Inspired Lifestyle For The Modern Woman: Style Me Pretty Nail Designs: Bows and More Bows! 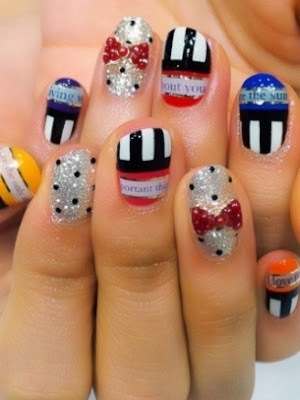 Style Me Pretty Nail Designs: Bows and More Bows! 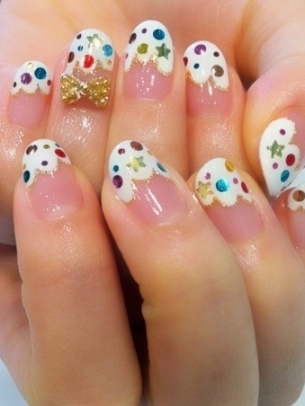 The traditional white french-manicure gets a not so subtle twist with the addition of colorful dots, gold stars and a gold bow. Jazz up a stripes and polka dot half-moon manicure by adding sparkly silver bows. Go for the traditional nail-art tattoo designs with a painted on a bow. We would skip the striped nails but the silver glitter with black polka dots and red bows are perfect. Give your manicure a touch of Audrey Hepburn style by attaching these cute pearl bows. See more of our Style Me Pretty Nails articles. Which nail-design will you try? Leave a comment below. I love the first manicure. oh yea I'm getting one of these soon.